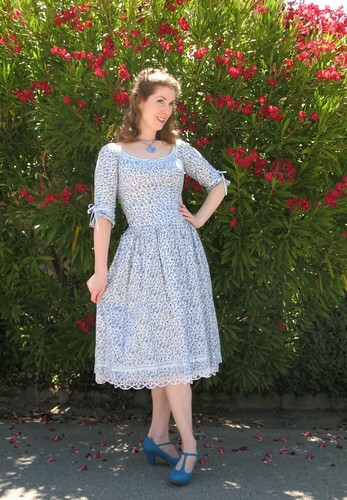 Such a sweet, charmingly pretty dress. I tend to think the images on the pattern sleeve were aiming at bridal attire (with a charming note of Georgian style thrown in), but I agree that it's not perfectly clear what their intentions were. Perhaps they wanted their customers to interpret it in their own way, just as you've done with this beautiful dress. 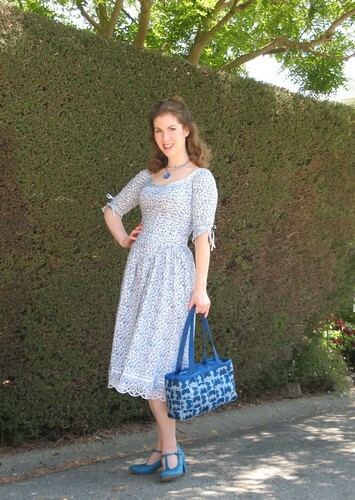 Another lovely dress--blue is your color! All my zipper stories are failed zipper stories! Hate them with a passion.... I will use them, but it's usually a last resort. Love the dress! Feminine, flirty and fun. You look great! I remember that pattern in the books. Yes, wedding dress. Back in the late 80's to mid 90's almost any wedding dress could be adapted to costuming. 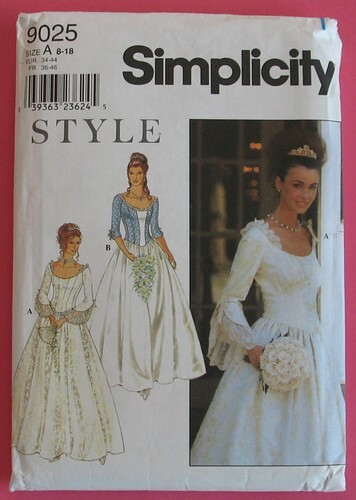 I used bridal pattern all the time for my Victorian costumes. Just the style back then, I guess! Not historically accurate, but good enough at the time, when it was hard to find accurate patterns. But I love how you've adapted it to everyday wear. 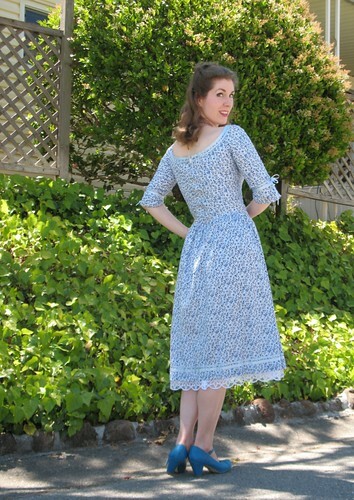 You've made this dress so sweet and wearable, but still with a historical edge! I'm with Becky - most of my zippers are fails in one way or another. Except for fly fronts. For some reason I can execute those nearly perfectly! 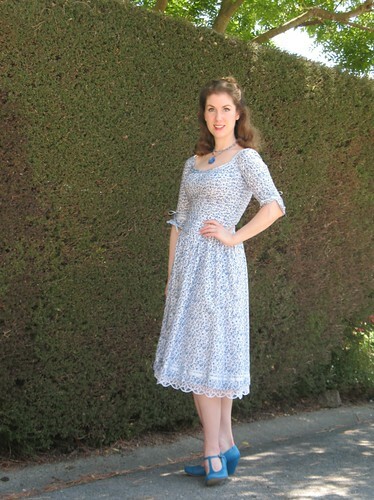 I've admired your blog for a while...this dress is very pretty. I love blue; it's my favourite colour. 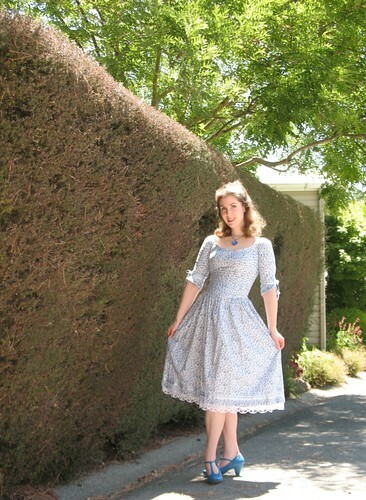 Your dresses are inspiring me to sew for myself again. But your slim figure is much better than mine at the moment! I've gained a lot of weight since I used to sew for myself, so that doesn't make it very encouraging to sew again. But I do love looking at your blog! I love your blue purse and shoes too. You mentioned quilting cottons, will you give us the pros and cons of sewing garments with that fabric? 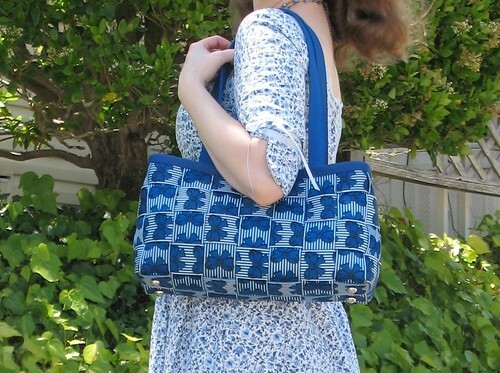 What ushered you away from using it as a fabric of choice? Which fabrics on the fabric continuum are you currently favoring? Has Britex Fabrics spoiled you (I wear a drool cup when I visit their website)? While blue is certainly flattering, I think purple is your color (though a blue-purple might offer complexion nirvana). Sorry to comment on an older post, but I'm a little behind on my blog reading. :) I have a question about your zipper story. Are lapped zippers easier to zip up than invisible zippers are on fitted garments? My experience has only been with invisible zippers so I wasn't aware there was a difference in wearability. Most standard invisible zippers are not very strong. If something is a tad small, you can generally force a standard zipper to close – not an invisible zipper. Also, any seamline bulk (like where the bodice meets the skirt) can make it difficult to close an invisible zipper). I live alone, so I have to reach around my back to zip a back seam closed. That motion expands the shoulders, making it more of challenge to zip a fitted garment. In my opinion, the invisible zipper is much more finicky than a standard one. They certainly have their place, but I do think twice about installing one because I have had issues with them in the past! They do make bridal invisible zippers which I have never used, but I imagine they must be of better quality.